It’s that time of the year again for Seedcamp Companies! The SC team and 25 Seedcampers are travelling the US visiting the most important technology hubs, meeting investors, and catching up with our friends. 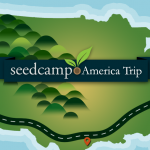 For over 5 years, our US trip has been a key component of the Seedcamp program. The goal of the trip is to connect Seedcamp founders with the ecosystem in the States, fundraise from US investors, and learn from local successes. This year, we’re upping our game in two ways: Not only are we meeting more investors and mentors than ever, also did we just announce that we will now go on our tour twice per year. Below is a summary of how the US tour will look for our teams, but If you are interested in our trip, the meetups, and events, make sure to follow our US trip Tumblr and follow us on Twitter and Facebook. We will post photos, check ins, and daily updates. Each week, we’ll post a recap of what happened, and make sure you are all up to date on what is happening. This year, we are travelling to New York, Boston, San Francisco, the Silicon Valley, and we will visit Austin for SXSW. Access to these local ecosystems is key, especially as founders are looking for advice, network, capital, and validation for their startups. Through a combination of events, local meet ups, and office visits, we make sure to connect the entrepreneurs to the right people. In all those cities, we will hold local Seedcamp events. Much like our Mini Seedcamps in Europe, these events are based the teams presenting their companies, and interacting with mentors and investors in one to one sessions. Exactly like the events in Europe, these one day opportunities to network with a broad range of investors and successful entrepreneurs are a great base for founders to experience the local strengths and find partners with whom to work longer term. Last year, we had more than 200 of America’s top mentors and investors involved across the trip, this year, even more are signed up. Meeting local startups that are in similar phases of their development as the Seedcampers builds great connections and results in lots of friendships. As always, we make sure to engage with the local community – be it with our friends at General Assembly in New York, hack:reduce in Boston, various incubators and coworking spaces on the West Coast, or the wider tech community at SXSW. Nothing transports the value of a strong company culture more than visiting some of the most successful startups and tech companies in person. That’s why we visit role models such as Google, Twitter, Facebook, Tumblr, Foursquare, Amazon, Microsoft, and Paypal, and connect with their startup and developer teams, have a chat with the founders and early employees, and enjoy the atmosphere of their campuses. This has brought about strong connections between Seedcamp companies and technology partners such as Facebook, Amazon, and Twitter, who are working directly with Seedcamp companies to support their products and services. Besides the best European investors, we have always made it an explicit goal to attract US capital for our startups. The US trip is a great way to connect with and raise money from the best investors. About half of the mentors at Seedcamp events in the US are investors. The sessions are a great way for us to present to them some of Europe’s best early stage startups. Besides talking to potential investors for their startups, founders also get to learn from the investors experience with their portfolio companies, tap into the wider network, and build relationships early. Funds like Union Square Ventures, Redpoint, Lerer Ventures, Atlas, Next View, SoftTech,500startups, and more have invested in Seedcamp companies who they met on the US trip. That’s why we make sure to meet the investment teams of the best funds on our tour. We are proud to have an open door to some of the best investors in the places we visit. This way, we’re are able to not only spend time with them during mentoring sessions, but also to visit them at their offices to deepen the conversations. This year, amongst the already mentioned investors in Seedcamp companies, we’re meeting Partners of iA Ventures, Andreessen Horowitz, New Enterprise Associates, O’Reilly Alpha Tech, Greylock, and others to enable our companies to present to the best VC funds of the world. Some of the greatest technology companies are being built in the US, and we want to enable our teams to learn from the best. We have local events, meet companies and platform providers, and involve our friends all across the US in what we do. In each city, we make sure to meet with locals and learn from their successes through masterclasses and group sessions. This year, we are excited to hold sessions like this in all of the places we visit. In New York, we talk fundraising and deal closing with successful investment bankers. In Boston, Atlas Venture and hack:reduce are organising an afternoon conference on the Boston ecosystem, which includes the founders of Zipcar, Hubspot, and insights from various VC firms. Our San Francisco events include more masterclasses on deign and product building –AirBnB and others are hosting us and the companies. Most startups are building on top of the large tech companies’ platforms, and we make sure to get them exposure to the folks behind the scenes. At places like Facebook, Twitter, Microsoft, Amazon, 10gen, and Foursquare, we meet engineers and platform teams to get the word straight from the horse’s mouth: How can startups benefit and get the most out of these technologies. Besides meetups, and events, teams have done their homework and are meeting angel investors, lots of startups and community members in their industries, and get involved in events that are happening in the cities we visit. This is an immediately useful part and goes beyond what we could even plan: this year, 15 teams and more than 25 people are on the trip, and we aim to leave a mark in each of the places we go. Check out the teams that are coming along and get in touch if you want to meet up! Our next US trip is happening in October this year. If you are interested in taking part – make sure you apply to Seedcamp in the mean time and join the family. Applications are currently open for Seedcamp Berlin.